Your teen is flirting with the idea of becoming vegetarian? What do you need to know? Going vegetarian, or even vegan, has become more and more popular over the last years. What can you do, and what should you know about this food revolution? Let’s make sure you talk the same language as your tween or teen. There are different variations of vegetarianism. They go from “a lot” to “solely” plant-based products on the menu. Eat meat and fish occasionally, mostly went they eat outside their home. 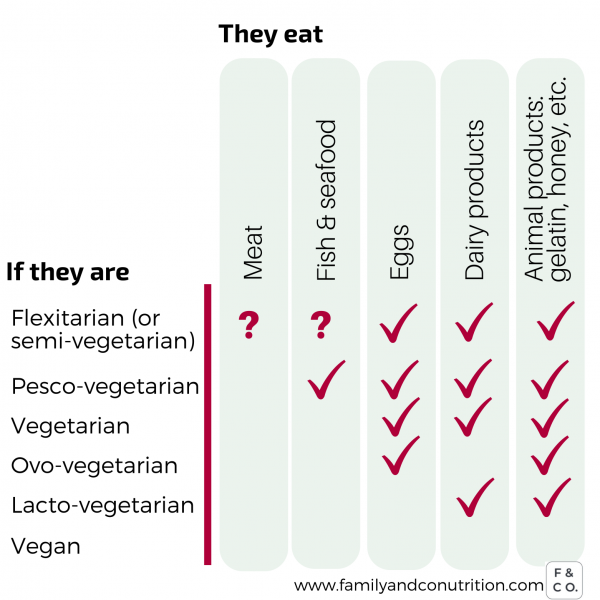 Don’t eat meat but they do eat fish (pesco), eggs (ovo) and/or milk products (lacto). If only state “vegetarian”, it often means they eat eggs and milk, but no meat and no fish. 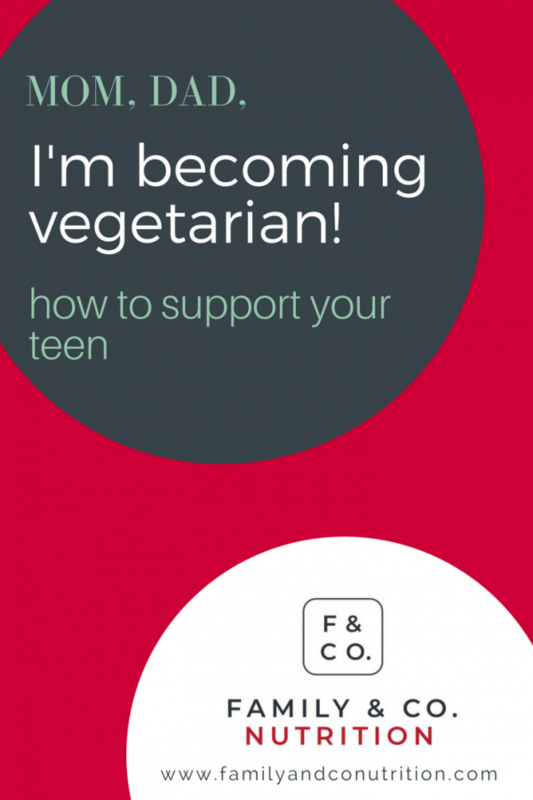 Is your teen’s decision to go vegetarian a good or a bad news? Well, with a little adaptation and flexibility, it’s good news! But it could be a bad news if not planned correctly. Eating less meat, more fruits and vegetables, more grains and nuts, more pulses and beans are all very healthy habits… that all your family could decide to embrace with your teen. It doesn’t mean the whole family necessarily have to become vegetarian. It’s time to support your teens, and adopt some (or all) of their new nutrition decisions. If they go 100% vegetarian, your family could decide to go 5% vegetarian…or 100%! The Academy of Nutrition and Dietetics, after reviewing the scientific literature on the subject in 2016, stated that a well-planned vegetarian diet, including veganism, is a healthy eating pattern at all ages. So there are no reason to put down your teen’s idea to become vegetarian. Yes to home cooked vegetarian meals! It is also good news because this might be the perfect circumstances to invite your teen in the kitchen, and start a new tradition (and get a cooking break!). Trust your teen. Show him/her that you value his/her opinion and judgment when it comes to food choices. Encourage your teen to make the whole family discover a new ingredient or recipe, and why not even get all together in the kitchen? Let the family cook, taste, discover, and eat together! Foster this behavior, and your teen will develop cooking competencies, autonomy and (therefore) pleasure in the kitchen and at the dinner table! It is a great opportunity to invite your teen to cook and teach his/her new knowledge to the whole family! How to include more plant-based food items on your menu? Subscribe to find out 8 ideas + a free list of vegetarian-friendly protein sources. Should the whole family become vegetarian? No. It doesn’t mean that everybody in the family should compromise their own taste, and cut meat and food groups altogether. If your teen decides that eating no meat is the way to go for him/her, it doesn’t mean it’s the way to go for all family members! Most importantly, to include some vegetarian meal in your week, you don’t need to “impose” any strict rules or beliefs. The fact that it’s tasteful, new and allows you to vary your menus are sufficient reasons to eat tofu and lentils! You don’t need to label yourself and your family “vegetarian” to discover new things. And you don’t need to go full blown vegan to enjoy the benefits on including more plant-based items on your menu. It can be one step at a time. If your teen decides that eating no meat is his/her way to go, it doesn’t mean it is the way to go for the whole family. More fruits and vegetables, pulses and beans, whole grains, plant-based protein sources, etc. Less sweets, less salty and high-fat snacks. Better for your future teen! It decreases the risks of many illness like type 2 diabetes, cardiovascular disease, cancer, etc. Better for the planet! Sustainable and eco-friendly. How did you learn about vegetarianism? Can you explain to me what it means? Why is it important for you to become vegetarian? Why not flexitarian since you have always enjoyed steak/shrimps/cheese/etc.? Are your friends adopting this eating pattern as well? Are there new ingredients you could make us discover as a family? 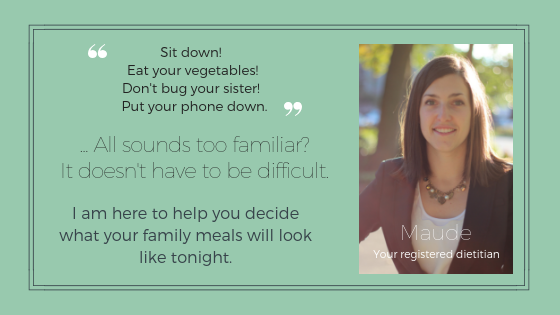 How can we support you as a family with adopting this new lifestyle? Would you like to introduce us to a new recipe that would be vegetarian, or adapt a family recipe into a vegetarian alternative? Take advantage of this situation to learn about your teen’s motivations and beliefs in nutrition. There is one red flag that you should keep in mind as parents. If becoming vegetarian only means cutting some food groups without replacing them by new food items, it should be addressed. Cutting whole food groups with no other modifications can lead to nutritional deficiencies. It would be a sign that your teen lacks the nutrition knowledge to plan wisely his/her new eating pattern. It could also mean that becoming vegetarian is a cover to eat less, gain control on her/his food intake, and to try to control her/his body weight. In all cases, if your teen start eating less or you are worried, we suggest you and your teen go see a dietitian. A nutrition evaluation by a registered dietitian will ensure that your teen’s new diet pattern is promoting health and pleasure, and is well balanced. Not the opposite! If your teen is becoming vegan, we strongly suggest to see a dietitian from the get go, as veganism involve cutting several food groups. 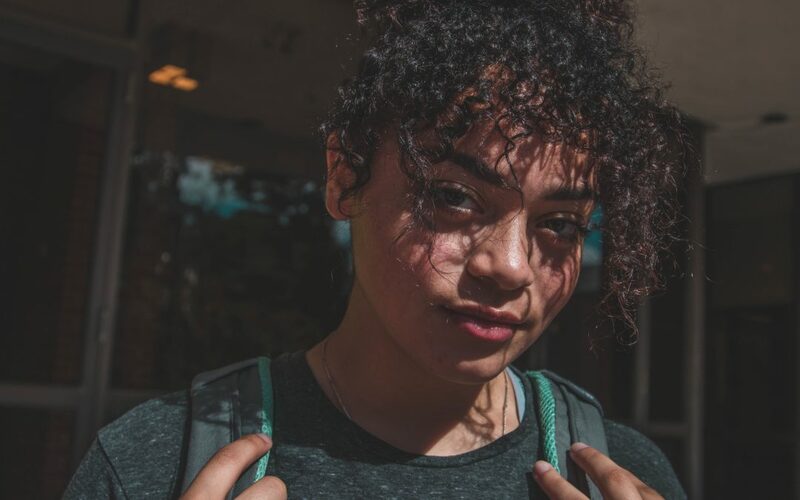 There are a real risks of nutritional deficiencies, and you and your teen should be informed on how to plan balanced meals that respect your teen’s nutrition beliefs. If you have doubts about the adequacy of your teen’s diet, invite him/her to see a dietitian with you. 8% of Canadians (that’s 3 millions of Canadians) are vegetarian or semi-vegetarian, and 25% of Canadians try to eat less meat. On the US side, 3.3% persons (that’s 9.7 millions of Americans) are vegetarian, from which half are self-reported vegan. That’s a lot of people! In the USA, the demographic group with the highest percentage of vegetarians are young adults: 5.3% of Americans aged 18-34 years old are vegetarians. 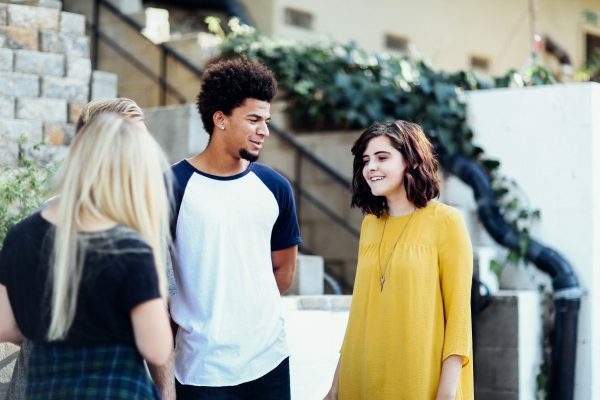 No, your teen is not alone! Position of the Academy of Nutrition and Dietetics: vegetarian diets. Melina V, Craig W, Levin S. Position of the Academy of Nutrition and Dietetics: vegetarian diets. Journal of the Academy of Nutrition and Dietetics. 2016 Dec 1;116(12):1970-80.